If the end of the baseball season and the start of the football season don't make you feel like crawling under a rock, if you have the irresistible urge to tear off your t-shirt and paint some enormous capital letter on your chest, if you aren't hoarse already from all the excitement, you'll be glad to know that Adobe has freshened up its tandem Elements offering again this fall. Version 12 of Elements is reassuring in other ways as well. It still comes in a box (but you can also download it), no subscription needed. It's still just $99.99 for either Photoshop Elements or Premiere Elements ($79.99 to upgrade) or $149 for the bundle ($119.99 to upgrade). And it hasn't changed its spots, still offering a subset of power features from Adobe's professional applications Photoshop CC and Premiere Pro CC in an interface designed for the occasional user. Adobe didn't mention any increase in system requirements over Elements 11, either. Which we also find reassuring. Just as your digicam includes both still and video modes, we like to think of this particular package as Elements 12 rather than Photoshop Elements 12 and Premiere Elements 12. But they are, indeed, two separate applications (which you can also buy as a bundle), both of which include Adobe Organizer. Last week Adobe briefed us on the new features in Elements 12. 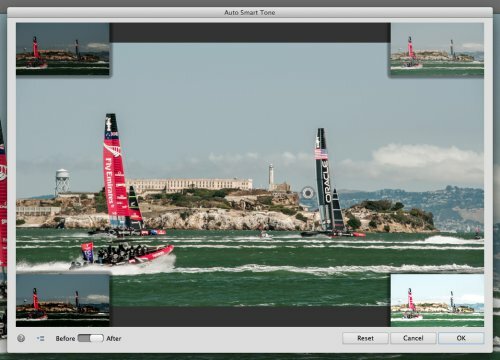 The thrust of this update, according to long-time Product Manager Bob Gager, is to help you get your images off your capture device and onto your desktop where the real fun is before returning the magical result to the wider world for "shoulder-to-shoulder" sharing. Setting Up Mobile Access. Just a few seconds with an Adobe ID. This "two-way anywhere access" is the theme song this year. And to make it work, a recent upgrade to Adobe's free Revel sharing service now enables video sharing. Revel is the one service on which Adobe has implemented its new scheme, but there's a new Twitter option as well. Our Revel Albums. As displayed by Elements 12's Organizer. During the briefing, Gager created albums, changed their contents and edited images on both a desktop system running Elements 12 and a smartphone running Revel. Despite a slight delay as data was transmitted between the servers and the devices, the albums and images remained in sync, including versioned edits in which both the original and the edited version were stacked in an album. He didn't have to do anything to keep these things in sync, either. It just happened -- as long as he was logged into both systems. 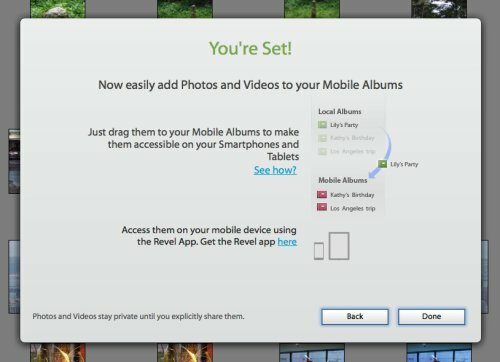 When we launced Organizer and enabled access to our Mobile albums by signing in with our Adobe ID, Elements found our Revel albums and Photoshop.com library as well. Both Revel and Elements enable a collaboration mode in which you can invite people via email to contribute to an album (for a wedding or a soccer match, say) and edit images. That's not all that's new in Elements 12, of course. Adobe again has borrowed some powerful features from Elements' bigger brothers and put handles on them, so to speak, so everyone from kids to seniors can use tOEM. So, for example, when you use the Straighten Tool to get that horizon level, the Content Aware technology of Photoshop CC can magically fill in the corners rather than crop the image tighter to hide the effect of the rotation. But it goes a bit further than adding just an invisible hand. The Auto Smart Tone in both products actually learns from the adjustments you make (using a clever joy-stick interface to the old Smart Tone Variations command). After a few images, it tunes its suggestions to your preferences. So two people making Auto Smart Tone adjustments could see efficient but different (and equally pleasing) automatic tweaks to their images after a while. Quick Effects. But no Custom or Favorites, although Gager has put it on the list. There are photo frames and textures, too..
Worth highlighting in that list is the new Guided Edit for restoring an old photo. Prior versions certainly made the tools available in Expert mode but Adobe has been flooded with questions about how to fix this or that in an old photo, so it simply added a Guided Edit to cover everything. Also worth noting in the list is the new Pet Eye correction, particularly since 30 percent of Elements users say their primary photo subject is their pet. During the briefing, Gager did a nice job on his cat's eyes with nothing more than a single click. Guided Edits -- Step-by-step navigation on how to get started, trim frames, add scores, transitions, titles and narrations, as well as animating graphics and creating pictures within pictures. Motion Tracking -- You can attach a graphic element like a thought bubble to an object (like a snowboarder) and it will follow the object through the sequence. We particularly applaud the Scores and Sound Effects options. After wrestling with hundreds of clips in our wedding video project, we really appreciate having a tool to generate music and common sound effects (like crickets chirping). And if we really appreciate that, imagine how we feel about the ability of the clips to regenerate themselves when you change the duration of the clip. We just love that. Auto Smart Tone is a new Enhance menu option based on the Photoshop CS6 auto correction algorithms. But, Gager said, "we kicked it up a couple of notches." Once the algorithm is applied, you can improve it to your liking by nudging it toward one of four extremes of the correction using a virtual joystick. Auto Smart Tone. Not just Smart Tone (Before), but an Enhance menu command that learns your preferred Smart Tone adjustments (After). Use the joystick to nudge it in the right direction. Even more impressive, though, is that when you click OK, "Photoshop Elements is going to learn from whatever tweaking I personally did to the algorithm," Gager said. When you use it the next time, it will learn from those tweaks, too. So it learns your personal preferences. After a while, you won't have to tweak. It's so cool, Gager said, it works in Premiere Elements, too, for video clips. Restore Old Photos is a Guided Edit. You are guided through the process step-by-step using the column on buttons on the right side of the screen. Restore Old Photo. A Guided Edit, Use the scroll bar to see the whole Edit. But the particular process of retouching an old photo is pretty labor intensive. So Restore Old Photos expects you to do all the work. We spent just a few minutes on what is our most unrecoverable image (we won't make you suffer it), the shadows eaten away by some fungus and not much highlight detail in the somewhat overexposed image anyway. Still there are recognizable faces and interesting detail. We could spend a week spotting it and still not be done. But the Guided Edit, which we list in the scrolling window to the right, listed all of our options and let us move back and forth between them. It advised which option was best for which problem, too, which we did find helpful. If we had known nothing about retouching a damaged photo, we would have found this Guided Edit very helpful. And if we were just trying to restore a faded old gem, we wouldn't have had to do much work to return it to pristine condition. Camera Raw has been available in Elements for a while but it's worth noting that you can indeed edit your Raw files in Elements now that Adobe has gone subscription with its professional applications. This gives you two options for using Camera Raw with a permanent license: Elements and Lightroom. 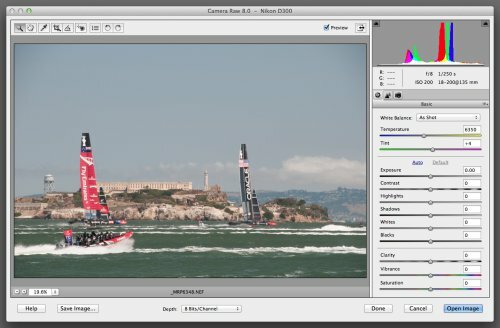 The Elements version is missing a few options in the other full versions of Camera Raw, with just the Basic, Detail and Camera Calibration tabs available. Camera Raw. Same Basic controls, which are the most important thing. Here we open a Nikon D300 NEF, then crop it and adjust the sliders. So there's no perspective control with Lens Corrections, no Presets, no Snapshots, no Effects, no Tone Curve, No HSL/Grayscale conversion, No Split Toning and even the Camera Calibration lacks sliders. So it's a stripped down Camera Raw but not a crippled version. We did recover a bit more highlight detail in Photoshop's version than in Elements version in the one landscape we tested. We suspect Elements is working with 8-bit channels in Camera Raw, but we've been wrong before. In June we had a little DVD project we threw at iMovie and Elements 11. It was a clip digitized from a VCR tape on a Panasonic DVR. We had to trim the clip and drop it on a DVD menu so it could be viewed on a DVD player or player software. Trimming the clip wasn't difficult in either program and both offered auto color improvements to the surprisingly desaturated original. But Elements added the DVD menuing that we would have had to use iDVD to do otherwise (and it really wasn't that big a project). 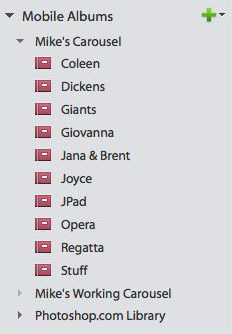 And it was pretty simple to pick a theme from the Share+Publish menu and be done with it. Which is what Elements is all about. DVD Themes. There are several genres to choose from including Movies and Slide Shows. Premiere Elements has some pretty sophisticated tools itself, including image stabilization (Video Stabilizer), picture-in-picture and the same automatic color correction in Photoshop Elements. Time Remapping slows down or speeds up the footage. Our review copy put a banner over the video clip making screen shots difficult to read, so we'll postpone our examples until we can get a license key. Motion Tracking. The thought balloon follows the snowboarder. We did notice quite a dropoff in editing performance between Premiere Elements and Premiere Pro CC. Just rendering one short clip with the Video Stabilizer and Auto Smart Tone took a long time and we couldn't simply play through the clip in real time without rendering it. Hmmm. The full price for either Photoshop Elements or Premiere Elements remains $99 or $149 for the bundle. Existing customers back to v1.0 are eligible for the upgrade pricing of $79 for individual products and $119 for the bundle. Adobe typically discounts Elements $30 for both Mother's Day and Father's Day. Elements is available now from Adobe and will be on store shelves shortly, the company confirmed. From the beginning Elements was designed for the person new to the game. At first it included teaching aids but as time went on, it tried to make it easy for the occasional user to add sophisticated effects to both images and video. Basic mode can improve if not optimize the originals but Guided Edits really put the fun back in the game. And true to its roots, Elements doesn't dumb down those edits. In Expert mode you can see what the file would look like in Photoshop. The shortcuts it takes are in the interface, not the data. We know of no other product that takes on the task of teaching you how to do things. And we know of few products as robust as Elements 12 that make it as fun to do things. That's a winning combination in our book. SAN JOSE, Calif. -- Adobe has announced the availability of Adobe Photoshop Elements 12 and Adobe Premiere Elements 12, new versions of the No. 1 selling consumer photo and video-editing software. Customers will enjoy powerful mobile capabilities and reap the benefits of professional-grade editing technology delivered in an intuitive experience that makes it easy to create stunning results. "Our customers have a lot of photos and videos and they love to use their home computers to organize them and be creative, but they also want the freedom and flexibility to view, edit and share on their mobile devices," said Lea Hickman, vice president products, Creative Consumer Business, Adobe. "Photoshop Elements 12 and Premiere Elements 12 will provide customers with the best of both worlds, quickly, easily and at their discretion." Mobile Access -- With Elements Mobile Albums, customers always have access to their precious memories. Powered by Adobe Revel , people can view, edit and share their photos and videos seamlessly on their smartphones, tablets and desktop devices whether at home or on-the-go. Pet Eye Correction -- Added in response to customer requests, Pet Eye provides an easy solution to the problem of flash reflection in animals' eyes, which is not addressed by Red Eye correction technology. Auto Smart Tone -- Exclusive intelligent software that learns a customer's editing preferences, resulting in one-click adjustments based on their choices, which gets better the more you use it. 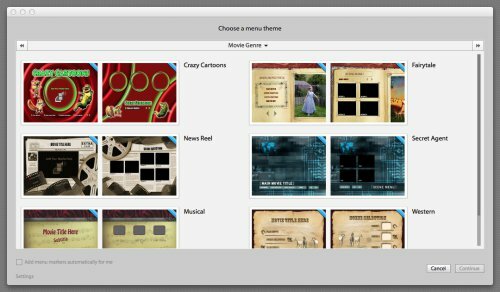 Quick Frames, Effects and Textures -- One-click photo frames, effects and textures, inspired by the most popular looks customers have been creating in Expert mode. Guided Edits -- Step-by-step instructions to create Zoom Burst and Photo Puzzle effects, as well as Restore Old Photo, which enable users to restore damaged or old photos. Straighten Tool -- Now fills in missing edges through the use of exclusive Content-Aware technology. Share to Twitter -- Share a photo with a tweet on Twitter. 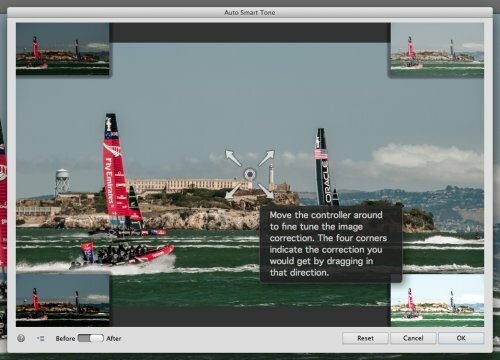 64-bit support for Mac -- Allows for more efficient use of your computers' built in memory, maximizing performance and enabling larger image files and videos to be edited quickly. Scores -- More than 50 soundtracks that automatically regenerate to fit the duration of a clip, making it easy to create home movies with perfectly timed intros, outros and background music. Sound Effects -- More than 250 effects that add excitement and dimension to audio tracks. Auto Smart Tone -- The same exclusive technology found in Photoshop Elements 12, for video. Film Looks -- Four new filters to add stylized Hollywood flare to home movies including Comic, Trinity, Yesteryear and Cross Process. Motion tracking -- Spotlight your subject by adding graphics, text and effects that move with the object. Adobe Photoshop Elements 12 and Adobe Premiere Elements 12 (Mac and Windows) are immediately available for purchase at http://www.adobe.com for $99.99, with upgrade pricing of $79.99. The Photoshop Elements 12 & Premiere Elements 12 bundle is available now for $149.99, with upgrade pricing of $119.99. They will soon be available at retail stores such as Adorama Camera, Inc, Amazon.com, B&H Photo and Video, Best Buy, Best Buy Canada, New Egg, Office Depot, OfficeMax, Staples and Staples Canada. Adobe Revel is an app available for iOS and Windows devices. 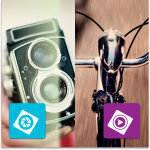 The app is free for up to 50 photo or video uploads per month.